Petsies Affiliate Program: NOW EARN 15%! Our Affiliate Program is perfect for anyone who wants to earn money while helping spread pet love worldwide! Upon becoming an affiliate member, we will provide you with a unique & trackable affiliate link. 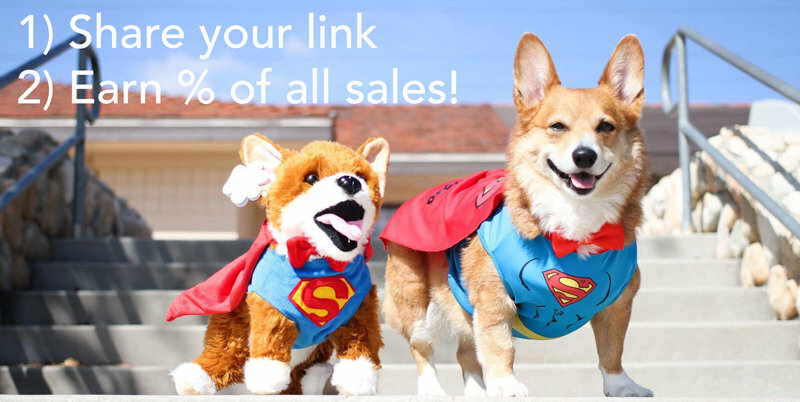 Each time someone clicks on your link and makes a purchase on our website, you'll receive 10% of the sale. We will also provide you with a dashboard where you can track your progress and request payouts at any time. UPDATE 1: ALL NEW AFFILIATES WILL BE MANUALLY APPROVED. After registering, please email [email protected] with the intended usage of your affiliate link to be approved. UPDATE 2: We are temporarily offering large 15% affiliate fees. Join now! Email: send emails to your friends and family; use listservs of organizations you belong to; let your coworkers know about Petsies; etc. Above all, we want to thank you for helping spread our vision to more pet lovers around the world. You are helping bring smiles to countless faces, giving comfort to those who have lost a furry friend, and ultimately celebrating the unconditional love and joy pets bring to our lives! The reward is added to your account after we charge the customer’s credit card, which occurs when we review and approve artwork. After all, we need to make sure we have a real paying customer before we can distribute cash to you! If you conduct any fraudulent activity with your affiliate link, your account will be suspended and you will forfeit all earnings. This does not prevent us from seeking additional damages. You can request a payout whenever your awards exceed $20. Payouts are sent to you by bank check or PayPal (if international). REMEMBER TO VIEW THE FULL AGREEMENT HERE.